Los Feliz Din-Din A-Go-Go is a really cool weekly event in my neighborhood (in the Catholic church parking lot), at which several food trucks congregate. I believe Mandoline Grill is always there, and there’s a rotating cast of other trucks. My friend Ris and I were already planning on going a few weeks back. 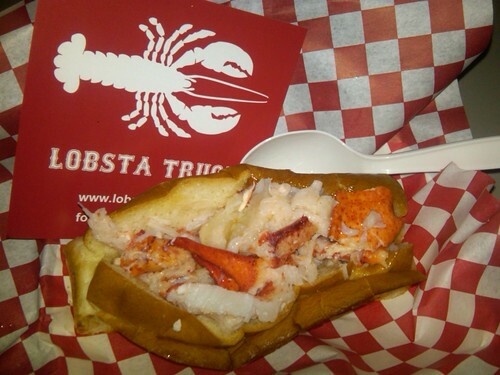 That morning, I checked Twitter and found out that the Lobsta Truck was going to be in attendance. I was very happy to reveal the news to Ris, who hails from the Boston area and is VERY MUCH a lobster fan. The Yelpers warned that the lobster rolls were small, but I don’t have a huge appetite so I wasn’t worried. But you know what? The Yelpers were right. I don’t know if you can tell how small this is… but that’s definitely not a standard size hot dog bun. The lobster roll may or may not be as long as that spoon. I probably should have eaten the roll and been done with it, but I ended up going over to the Great Balls on Tires truck. I was torn between the Ballafel and the Ballywood. Luckily the decision was made for me, because they were out of Ballafels and only had one Ballywood left. 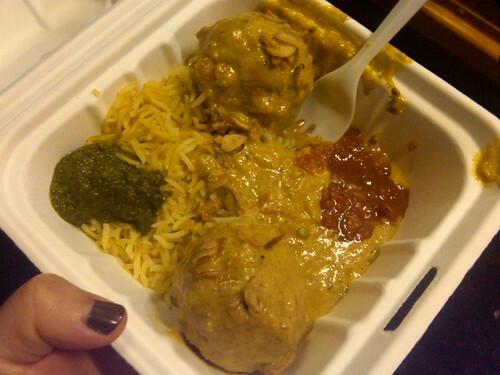 The picture on the truck only showed one ball but I got two, and like I said I don’t have the biggest appetite. For some reason I ate both those chicken-balls anyway. I was going for the gold! 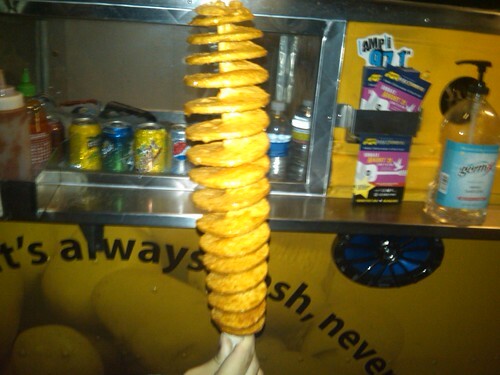 And then Ris got a Tornado Potato, and I had a bit of that. Because… I mean, look at it. It’s hard to tell from that angle, but that’s all one potato, masterfully swirled. The People: It means dirt in Yiddish. Me: I know, but what’s in the sauce? The People: They wouldn’t say, but it’s the most popular one. 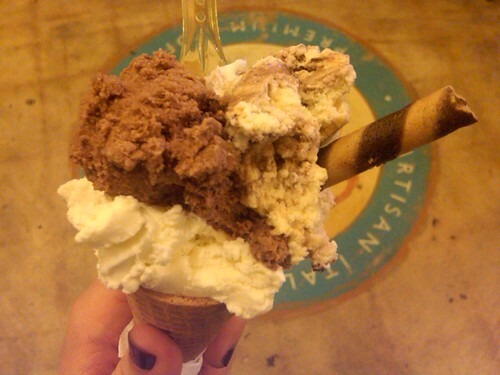 Then we left the Din-Din, and went over to Gelato Bar. Because… I wasn’t already overfull. Crazy enough, there were three flavors on tap that I hadn’t tried yet! And one of them was olive oil flavor… and I LIKED it. Trade secret: I think you get more when you order a cone. Olive oil tastes like the “ice cream” (soy) in Tofuttis. Which I actually like. So… cool. If you’re in Los Feliz on Monday nights… go to the A-Go-Go! It’s fun and crowded, like a food carnival. love the twirly potato tornado and the pirouette cookie. I think pirouette is spelled wrong, which oddly reminds me that Jordan McCarthy got that word wrong in the district spelling bee in 6th grade. my head is full of unimportant factiods like that. Next Next post: A Cure for the Mondays: RAINBOW CUPCAKES!! !